Desktop power supply 48W-Shenzhen Jinrui Energy Technology Co.,Ltd. Super features: Wide voltage input 100V-240V, small harmonics, high stability and reliability of high demand products, with over-voltage over-current short circuit protection, automatic recovery function, over-temperature protection and multiple protection features. Efficiency reaches 80%, small standby power consumption and truly achieves efficient energy-saving, work stable under -10℃ to +40℃ for 50,000Hours at least. Lighting surge withstand 6KV or above. Intelligent control: PWM control carrier. Products achieve modular, standardized, easy to install and maintain. 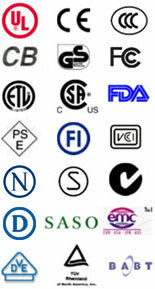 All products designed according with EN55022 / EN61000-3-2 / EN60950 / UL1950 and ROSH compliance.